The New England Classic Traditional® wood panel system is simple to specify and install. Four basic heights, 32", 36", 40" and 44" are combined with five panel widths, 9", 12",15", 18", and 23", to accommodate almost any application. Available with either 4" base rail (32" an 40" FramePak ® ) or 8" base rail (36" and 44" FramePak ® ). Prior to installation, prime panels, then sand with 180-grit paper. 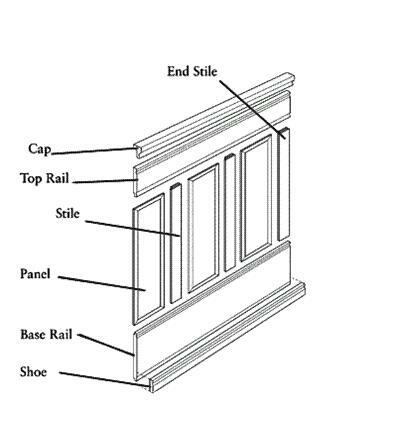 It is not necessary to prime stiles, rails, shoe, cap, or casing (or factory-primed panels). After installation, apply one coat of paint to panels. DO NOT SAND STILES, RAILS, SHOE, CAP, OR CASING. Fill all nail holes with a paintable vinyl-based spackle. Finish coat all parts together. Gentle household cleaners may be used, if required.